Several weeks ago, we had a guest pastor give a sermon at Church, and it’s only now that I’m realizing that God was speaking to me then and continues to do so now. The sermon was about trusting God and having faith in His plan for us. The pastor compared God (the parent) speaking to us (the child) in much the same way we as parents speak to our child. The pastor’s example was him calling his daughter away from the television. He asked his daughter once, she did not listen. He called her again, she acknowledged and slowly started toward him, pausing every couple of steps to look back at the television. He called her a third time, a little more sternly and it was only then that she hustled over to him and obeyed. We are very much like our children when it comes to following our Father when He calls us. When God speaks to us, we may acknowledge Him, but we also question Him and whether or not we should follow what He says. Not necessarily to be disobedient, but because we do not have faith or the courage to make the change in that moment. A second example the pastor shared was a moment when God spoke to him to make a career change. He said he heard God tell him that he needed to quit his job TODAY. Naturally, that is much easier said than done. The pastor had a new wife and child on the way and anyone who is married will tell you, a husband coming home to his wife saying, “hey, so I quit my job today, because God told me to do it,” isn’t going to fly over too well. Pastor did speak to his wife and they prayed and ultimately he decided not to quit his job, yet. Long story short, he interviewed for a new job opportunity and there was another pastor in the room who stopped him during the interview and told him that he knew he [our pastor] was being disobedient. That he knew God had spoken to the pastor but he had not yet obeyed him. Whoa. That was God finally yelling at His child, stopping him in his tracks and telling him what he needed to do. The pastor went home and quit his job. Within a week, the company he had interviewed for called him back and he got a new job that paid far better than the previous one. It was only then that he knew he should have listened the first time God spoke to him. There have been many times in our journey where we have both felt like God was speaking to us. It is not always about making a change, but He does or says things to us to let us know that He is right here walking right beside us. He consistently puts people in our lives to guide us and take us exactly where He wants us to be at that point in time. I have spoken on this before, at a time where my faith was already being tested, at a time when we had not been to Church in quite some time. It was not too long after, that God called us to come back to Church. Joseph called me from work and told me that he felt like God was trying to tell him something and that we needed to go back to Church. So we did. We went back exactly when we needed to. We have grown so much and our faith has been restored. I’m not saying we are spouting off Bible quotes or living a life of a perfection now, but we are trying to do better. I am now recognizing God’s presence in our lives even in moments that seem hopeless. I wrote at one point about longing for Braxton to speak and it wasn’t but a week later that out of nowhere, Braxton looked right in to my eyes, grabbed my face, and pulled his little mouth to my cheek to give me a kiss. It was in that moment that I felt God telling me that if I just slowed down and paid a little more attention, I could see and feel my little boy speaking greater volumes than his voice ever could. Braxton ‘tells me’ he loves me all the time by doing exactly what he did in that moment. His little hands reach up to grab my cheek and he ever so softly comes forward to give kisses. He does not have words, but God has shown me that he can speak right to my heart. Finally, it has been one week at the new daycare and we are very happy with the choice we had to make. 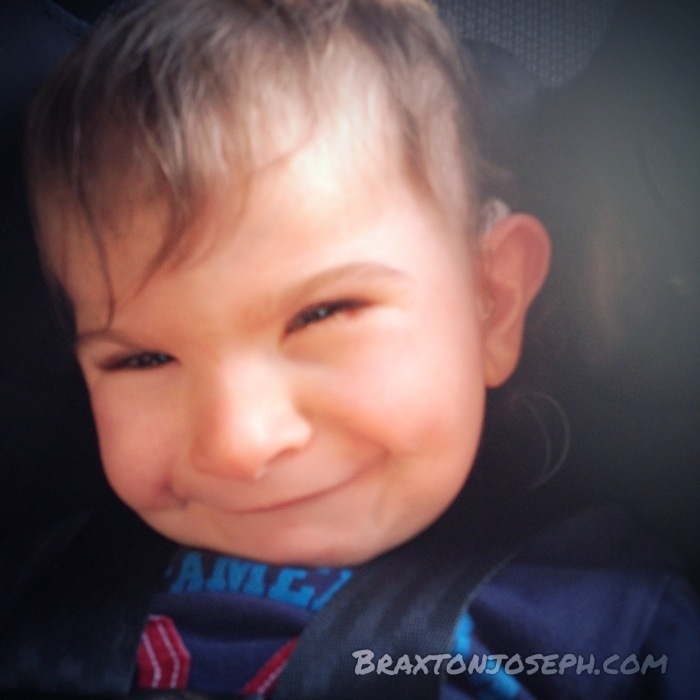 We are all still adjusting, but Braxton seems to be very happy and his needs are definitely being met. The teachers are still giving him time to explore and adjust, but they are wearing him out! He’s actually taking regular naps at a scheduled time, and sometimes he can’t even wait that long! Yesterday, the Executive Director caught me as I was leaving the daycare to check in with me to see how we were doing and if everything was going okay. I told her we were very happy with our decision and her staff. They are all very friendly and have communicated with me quite a bit about Braxton and getting to know him. She told me that her teachers are absolutely smitten over him and she often has to get on to them for stopping in to visit him too often. He’s quite possibly the hardest child NOT to fall in love with. Having worked in a daycare, I know that all children find a way in to your heart, but there is always that one child you bond with more than others, and Braxton seems to be that child for so many. The director also talked to me a little bit about some of the plans the teachers have for Braxton. She said one teacher had come to her in the morning and excitedly handed her a list of equipment she wanted for Braxton to keep him happy and comfortable. Some of the things included a Tumbleform chair for feedings so that if he fell asleep he would still be upright and comfortable during his feeding. I am so thankful they have already fallen in love with him and are so enthusiastic about helping him reach the potential we all know he is capable of achieving. Isn’t that awesome!? I’m sooo excited for Braxton. It’s clear that he will walk much sooner than we think. I can’t attribute that all to the new daycare, but I’m certain it’s been a motivator even in just a week. Braxton is in a class with all boys who are high energy and always on the move. Surely he is sitting back looking at them thinking, “Hey I can do that, too!” He’s also been babbling more. Every day this week when I picked him up he started babbling from the back seat. I’ve even heard some new sounds. It may be a while before I hear words, but for now I love the sound of his babbling and I love the special moments we have where he can just look at me and I know and feel his love for me. Learning to listen to God and trust in His word is sometimes hard to do, and we are still learning every day. Much in the same way our children have to learn to listen to us and trust that we actually know what we’re talking about. We tell them not to touch the stove because it’s hot and they will get burned, but they touch it anyway. We give dating advice in hopes to spare them a broken heart, but they don’t always listen. One day they look back and realize their parents weren’t crazy and knew exactly what they were talking about. God tells us to trust in Him and the plans he has for us, but because we are still trying to walk our own path, we often fail to recognize that He knows what is best and is simply trying to guide us to the right path. Though we walk with trepidation, our faith will not waver. We know that our future is full of hope because we do not walk this journey alone. Beautiful testimony to God working things out. ❤ Thank you for sharing. Love you guys!! Thanks to both of you as well! We are so grateful that God led us to you. We’re actually coming up on a year since we started at PSM. There have been so many great changes in that short time. Love you guys, too!